Over the past several years I’ve been slowly but surely making my way through the Kowalski Family books by Shannon Stacey. They cover the romantic lives of the Kowalski cousins in New England and the people in their lives. I started reading these because Ms. Stacey writes the kind of straightforward, serviceable romance novels that let the reader slow down, read about some characters who aren’t too far from yourself and people you know, but just far enough to be fiction, and have a little happily ever after and steamy times as well. Basically, she’s become my new Nora Roberts since Roberts has been slipping of late. In All He Ever Dreamed Ms. Stacey aims to deliver a contemporary read with average 30-something characters. There’s also the bonus that neither of the leads are physically or mentally abusive and don’t cheat. But, it was just so-so for me. While All He Ever Dreamed was a cute, fun, light read, it was predictable. Ridiculously so. I have great affection for the friends to more storyline, but something didn’t work so much for me here, and that something was the characters’ emotions. When our protagonists get together it as perhaps the most emotion lacking, lifeless encounter I’ve read, possibly ever. It was definitely a disappointment from Ms. Stacey. Besides the problems with emotion and a lack of steam, the depth–or lack thereof–of both Josh’s and Katie’s characters was frustrating. I wished we could’ve seen more of Josh besides his desire to leave (he got left holding the bag for his siblings in running their family’s lodge), his propensity to mope around, and then continuing to do nothing but thinking of leaving even after he made his initial choice to stay. In retrospect I also wish Katie had done more than sit around and wait for Josh to come back. I’ve read a lot of romances lately with female leads who display much more agency, and that left a bitter taste in my mouth with these two characters. I should have loved them, but they just didn’t DO anything to win my affection in this outing, which is a waste of the buildup in All He Ever Needed and All He Ever Desired. Which brings me to perhaps my biggest complaint: there was really no story in the A plot. The B plot had a nice arc, but we’ll get there in a minute. The A plot is supposed to be Josh wanting to leave, getting to leave, and returning. Those things happen, but there’s nothing extra to it. Josh is 30, and it’s entirely typical for people in their twenties/early thirties to dream about going to a city, trying on a new career, learning new things, meeting new people, find out what they’re good at etc. In this book, when Josh gets a chance to get away, he does nothing like that. He goes on a six week road trip and wakes up to the reality that he did have what he wanted at home. But, how did he know? And Katie remained the same, which is part of her characterization as steadfast, but with his storyline being so one note, we really needed something more from Katie. The B plot was better. Focused on Katie’s mom Rosie is the live-in housekeeper at the lodge. In previous books we’ve explored her role as mom to the Kowalski kids, her relationship with her deceased husband, and her coming around to forgive his best friend for actions 20 years ago and build a relationship with him. These characters had growth, development, and used their emotions. If only they were the A plot. Sometimes my Nook is a dangerous thing. Heading into this year’s Cannonball Read I had a game plan. I went through my Goodreads to read list, picked the books from the past few cannonballs that I hadn’t gotten around to and really wanted to read. I also looked for books in my to be read that would work for various challenges on Book Riot’s Read Harder Challenge, and made a big list for myself. I then went to my lovely library’s online catalogue and put in requests for the first few months of the year so that the books I wanted to read would magically arrive at my local library and weekly emails would alert me to their presence. It was a flawless system! Except that I forgot to include space in my schedule for book recommendations from friends and what I like to think of as decompression reads. All He Ever Desired and All He Ever Needed before it are definitely decompression reads – something that I can just read without my brain having to solve a puzzle or unpack greater meaning. These types of books are often underrated, but I feel they are absolutely necessary to my overall reading experience. When I finished All He Ever Needed I wanted more of the characters and locations, and more time away from my real world. So, I immediately downloaded All He Ever Desired to my Nook. It was the definition of an impulse buy, but I can happily say that it was five dollars well spent. The book picks up immediately after its predecessor. The Kowalski family member featured this go around is Ryan. After college Ryan built a life for himself several hundred miles away from his family. He has done well professionally, but failed at marriage. He’s back in his hometown of Whitford to oversee a crew from his building company making repairs to the inn his family has owned for generations. This has also put him back in contact with Lauren Carpenter, the girl who he always wanted, but had married his best friend. Lauren is herself at loose ends. Divorced for 8 years and raising her 16 year old son on her own during the week before he’s off to his father’s house on weekends, Lauren finds herself wondering what if she had taken Ryan up on his offer to run away fifteen years ago. Ms. Stacey uses plot devices to put these two into greater proximity and romance ensues. While I may have complained bitterly in my previous review of her work that the timelines for these romances feel very, very rushed I felt it less with the Ryan and Lauren combination since distance and stepchildren were going to be hurdles that needed to be dealt with pronto (although if they are married by Christmas in book six, 10 weeks away from the main action in book five, I may change my mind about that). I continue my praise of Ms. Stacey as far as making her characters deal with real world issues, and having the solutions be real world solutions. I am also always pleased when the younger characters in the Kowalski world show up since the author gets the tone right with them, and was not disappointed in the characterization of Lauren’s son. There is something truly wonderful about getting just what you are expecting from a book. Take a little time, slow down, read about some characters who aren’t too far from yourself and people you know, but just far enough to be fiction, and have a little happily ever after and steamy times as well. Shannon Stacey uniformly delivers on that promise in each successive work of hers I consume. In some ways, she’s my new Nora Roberts. All He Ever Needed is the fourth book in Stacey’s Kowalski Family series. The first two were focused on the portion of the family living in New Hampshire, with book three introducing Sean from the Maine division of the family into the New Hampshire environs. Book four moves the action to Maine and the rest of Sean’s five siblings, focusing on his eldest brother Mitch. Here’s the basic plot set up: Mitch has made a habit of being a serial short term dater and living his life constantly on the move. Mitch is called home to help with the family lodge which is in some trouble and helping his youngest brother who’s laid up with a broken leg, he’s intrigued by the new girl in town and her reputation for never dating. It doesn’t hurt that he finds her distractingly attractive. After a nomadic childhood, Paige Sullivan has finally putting down roots. Determined to stand on her own two feet, unlike her mother, she lives by the motto “Men are a luxury, not a necessity.” But when Mitch pulls up a stool in her diner and offers her six weeks of naughty fun with a built-in expiration date, she finds herself tempted to enjoy a small luxury. This book is slightly longer than Stacey’s average and nearly twice the length of the book that comes immediately after it (which I am already reading) and it gives her ample time to lay out both the new location of Whitford, Maine as well as the various casts of characters who inhabit the town. I hadn’t intended to really read this book right now, I was skimming the beginning while waiting to finish the book I was reading but didn’t have handy, and then I was reading this book in huge chunks alongside my other reading. There was more happening in the book than just the Mitch/Paige storyline, and it was interesting separate from the smexy times which did eventually show up. My only complaint about the basic trope of this novel, that in six short weeks these characters are in LOVE is just how fast Stacey pushes their entire storyline, as I continue into the next book in the series. These characters go from being strangers to engaged to married in about 10-12 weeks by my best count. I know it happens, I know there are tons of people out in the world who have lived this experience and had it turn out great. But didn’t SOMEONE in your life mention that perhaps this was a bit fast? Literally no one in these books mentions that concern at all. When Mitch comes back after about 10 days from having ended things with Paige to confess his love (as is right and true to this trope) not only do they say their I love yous for the first time, the get engaged. They were strangers 8 weeks ago, and as we pick up on the next book not only are they freshly engaged, but buying a house and getting married in less than a month. A MONTH! Ok, I’m going to be done with that particularly strange rant, but you see where I’m getting at, I hope. These are easily consumable romances with good characterization which do not rise above the tropes, but mostly I don’t want them to, that isn’t what I’m here for. Your mileage most certainly will vary. I’ve got another holiday related collection for you, this time instead of holiday short stories its holiday romance novellas. The Season for Love is a collection of three Shannon Stacey works all tied (loosely) around the holiday season. In another review of Ms. Stacey’s works I’ve commended her ability to ground her characters in the real world, while still letting them play in Romance Novel Land ™. That is still true, and perhaps why when looking for something to download onto my nook before flying home for Christmas I chose this collection to go along with the two novellas by Diana Peterfreund. These are no Milan, but they are enjoyable stories that I happily read in two sittings. So what about the stories themselves? Holiday Sparks explores the Romance Novel Land ™ standard of a short term fling that turns into love from both sides. Added in is the fun balance of boy from high school getting a chance with the girl of his dreams. He’s going to rewire her parents’ house which leads to extended time together. Two very likeable and relatable leads, not the strongest of stories, but a good read. Mistletoe and Margaritas was probably my favorite of the bunch. Claire is a widow who has a strong friendship with her husband’s best friend Justin. He’s had more than friendly feelings for her for many, many years. This story explores what happens when it’s time to possibly move beyond friendship. Snowbound with the CEO is burdened with the worst title, and the shakiest backstory. The CEO in question, Adrian Blackstone, is stuck at a hotel with his executive assistant, Rachel Carter, whom he finds distractingly attractive, both in body and personality. Luckily for him she feels the same. This story really got going when these two had to figure out if they could possibly continue to work together after their weekend in the mountains. If you are in the mood for a little light, holiday themed contemporary romantic reads, these might hit the spot for you. This collection was read and reviewed as part of the charitable Cannonball Read. So, after a less than pleasant reading experience of Northanger Abbey, in which I never should have read the publisher’s note at the beginning as it ruined the plot of the novel for me and kept me from really sinking in to the narrative, at the end of last year I decided that a quick read – a restart button – was in order. Luckily for me, I received a Nook Glowlight for a Christmas present this year. I purchased a Nook original recipe over four years ago, and while I enjoyed the many positive qualities it possessed, I always felt that it was a slower read, so I was a little anxious about the Glowlight, but interested to see how the improved interface worked. And with a book on my to-read list on sale I jumped right in. The Glowlight is great and I zipped right along, reading Undeniably Yours in two sittings. 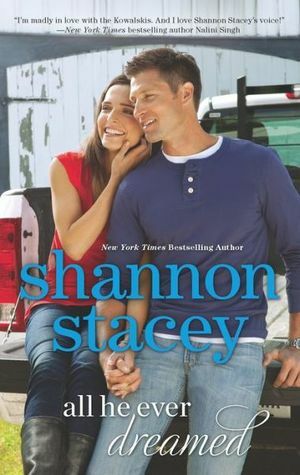 Undeniably Yours by Shannon Stacey is the second in a series of books based around the romantic adventures of the Kowalski family. Our leads this time around are youngest brother Kevin Kowalski former Boston cop and local sports bar owner, and Beth Hansen, a young woman living a nomadic life picking up odd jobs and changing cities twice a year. In a change from any other romance I’ve read, and I’ve read a few, our characters hook up within the first few chapters and it looks as if it’s going to be a one night stand – except that Beth finds herself pregnant, the 2% fail rate of the condom has landed squarely with them. This is unprecedented in what I’ve read before. I don’t know another author who would have her characters end up pregnant after a one night stand, and then explore what happens when people who are attracted to each other spend the time getting to know each other and gradually fall in love. It’s a well-paced novel, if slightly heavy on the first few months of Kevin and Beth’s relationship, but it’s hard to fault Ms. Stacey for that choice because so many moving pieces need to be organized to build the story from that point. We see the ups, the downs, and what the characters see in each other and how the pregnancy affects them. There’s an okay B plot with another romance between Paulie, Kevin’s best friend and assistant manager of the bar, and her former fiance, but the character of Paulie is best used in the story as a friend to both Kevin and Beth. I suggest this to you if you are in need of a light, happy read or really enjoy novels that explore various characters in the same family over several books. I know those are some of my favorite.